Fractures often take place in the hand. Hand fracture may cause pain, stiffness, and loss of movement. Some fractures will cause an obvious deformity, such as a crooked finger, but many fractures do not. Because of the close relationship of bones to ligaments and tendons, fractured hand may be stiff and weak after the fracture heals. Fractures that involve joint surfaces may lead to early hand arthritis in those involved joints. Figure 1. 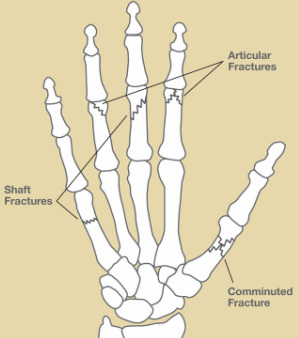 Examples of fractures in fingers. Medical evaluation and x-rays are usually needed so that your doctor can tell if there is a fracture and to help determine the treatment. Depending upon the type of hand fracture, your hand surgeon may recommend one of several treatment methods. A splint or cast may be used to treat a fracture that is not displaced, or to protect a fracture that has been set. Some displaced fractures may need to be set and then held in place with wires or pins without making an incision. This is called closed reduction and internal fixation. Other hand fractures may need surgery to set the bone (open reduction). Once the bone fragments are set, they are held together with pins, plates, or screws (see Figure 2). Fractures that disrupt the joint surface (articular fractures) usually need to be set more precisely to restore the joint surface as smooth as possible. On occasion, bone may be missing or be so severely crushed that it cannot be repaired. In such cases, a bone graft may be necessary. In this procedure, bone is taken from another part of the body to help provide more stability. 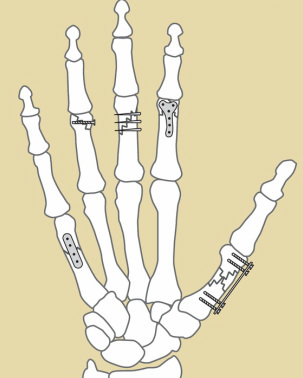 Hand fractures that have been set may be held in place by an “external fixator,” a set of metal bars outside the body attached to pins which are placed in the bone above and below the fracture site, in effect keeping it in traction until the bone heals. Once the fractured hand has enough stability, motion exercises may be started to try to avoid stiffness. Your hand surgeon may determine when the fracture is sufficiently stable. Perfect alignment of the bone on x-ray is not always necessary to get good function of the fractured hand. A bony lump may appear at the fracture site as the bone heals and is known as a “fracture callus.” This functions as a “spot weld.” This is a normal healing process and the lump usually gets smaller over time. Problems with fracture healing include stiffness, shift in position, infection, slow healing, or complete failure to heal. Smoking has been shown to slow fracture healing. Fractures in children occasionally affect future growth of that bone. You can lessen the chances of complication by carefully following your hand surgeon's advice during the healing process and before returning to work or sports activities. A hand therapy program with splints and exercises may be recommended by your physician to speed and improve the recovery process. Figure 2. Examples of plates, pins, and screws used to join fractures while they heal.